“Precious in the sight of the Lord is the death of His godly ones” (Psalm 116:15, NASB). With Easter approaching it seems appropriate to be thinking about death. And the good thing about death! While Easter is the time we celebrate the Lord’s resurrection, we should also remember that the only way human beings enter into eternal life is through the death of the physical body. Now, it may sound morbid to say that death is the way to eternal life, but the fact is, you have to die to live eternally. 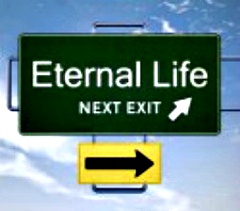 While we strive for eternal life, death and resurrection are the means through which we enter into eternal life. We cannot be resurrected from the dead without first dying (unless you are living when Christ returns). You may have experienced the unanticipated and untimely death of a loved one. What appears to us to be a broken or diseased body is to God a fully-formed spiritual being that has been fully prepared for eternity! And, God is ready and anxious for each of us to join Him in His presence! When we join God’s Kingdom, we effectively die to this world order and live in God’s Kingdom for eternity. Jesus characterized it as crossing over from death to life (John 5:24). Because Christians have already passed from death to life in the spiritual realm, the inevitability of a transition from physical death to eternal life should not be an odious proposition. The death of those who have been faithful to God is precious to Him. It’s the beginning of eternal life with God. “The wicked is thrust down by his wrongdoing, but the righteous has a refuge when he dies” (Proverbs 14:32). Once you fully process the fact that the death of the physical body is your entrance into eternal life, you should closely consider your present life and be sure that you are being all that God wants you to be for eternal life.